Sometimes life gives you a lemon and sometimes life gives you a peach, and a peach is exactly what we got when our foster pup, Sasha, arrived. 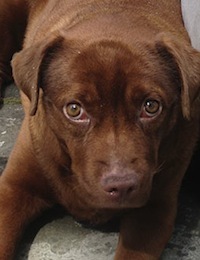 This two and a half year old lab mix had been through a lot in her short life. Dumped as a puppy but taken in by a family, Sasha went on to become increasingly ill as her under-active thyroid went undiagnosed and untreated for a lengthy period of time. 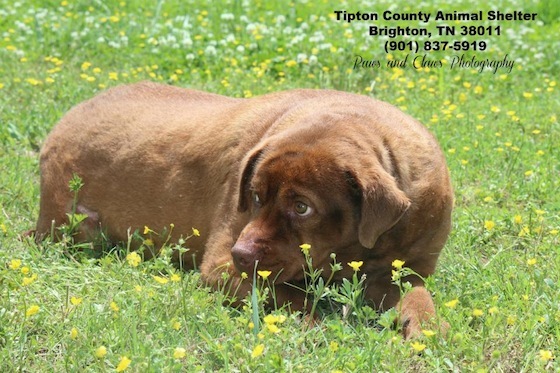 Sadly, not understanding her symptoms, Sasha was eventually surrendered to a high kill shelter in Tennessee. Already dangerously overweight and severely depressed, poor Sasha’s spirits sunk even lower. When volunteers returned to the shelter after the weekend away they found that this poor thing had not moved or eaten at all. Alarmed, they realized that she had become truly catatonic. This was a terrified dog who had lost all hope. All the shelter volunteers are heroes, but Sasha found herself a very special one in her TN foster mom who got her out of the pound and into her own loving home. The dedication and love that was shown to Sasha there were the first steps in getting her on the road to health and happiness. Diagnoses were made, treatment implemented, and the nurturing of Sasha’s confidence and soul began. Dave and I didn’t know what to expect when Sasha arrived. We knew she had already lost a remarkable amount of weight and that her spirits were lifting, but we also knew the trip from Tennessee to our New England home would be a tough one for her. As expected, she arrived nervous and scared. We gave her space and let her be in the “safe spot” she chose in the backyard under the lilac tree, and by supper time she was ready to break her three day self-imposed fast. She slept that very first night scattered around the bedroom floor with our other dogs. Ever since then she has continued to amaze us daily with her leaps of progress in her outlook and well-being. Sasha is extremely sweet and unbelievably cute. Truly, there is nothing that you want to do more than to pinch her cheeks when she is with you. Her big earnest eyes leave no doubt of the sincerity of her affection for you even when she may be too unsure of herself to participate the way she’d like to. She wants to be with people, loved her first foster mom’s kids, and thinks other dogs are fantastic, but she is also shy and not very sure of herself. Rooms of the house that she has never been in before scare her and she will avoid them, following us or the other dogs right up to the threshold and then coming to an abrupt stop. She cannot be coaxed to step over the line. But get a good game of ball going in the room and her need to be part of the family trumps her fear of the unknown. A new room has been added to her comfort zone and domain. Outside, on the other hand, she is your best buddy and will follow you anywhere without question. She sticks close, comes when called, and explores with curiosity. Every day is a new adventure in Sasha’s capacity to trust, love, and heal. We watch in wonder as her enthusiasm for life conquers the heartache of her past at an amazing pace. We look forward to each and every step of her progress and are so thankful for all the people who saw, too, just what a little peach Miss Sasha is and are greatly appreciative of all the work so many people do to get dogs like Sasha into their forever homes.